Anyone who regularly peruses these pages will know that this review is way overdue as Leica Ultravid binoculars have been out for quite a while now. Just when we were about to review the original Ultravids, Leica announced that they were coming out with a new HD version that would be a big advance over the previous version, so we thought we’d wait for the new ones rather than put effort into analyzing something that was destined to be obsolete soon. So we waited… and waited! There were production issues at Leica, and in their defense, they got a finished product at one stage and decided it just wasn’t good enough, so instead of rushing to market with a beta version, they went back and did it over until they were satisfied. We got a 10x42 and an 8x32 Ultravid HD (the latter is reviewed separately) for review and we can tell you up front, they were worth the wait. These are the binoculars that Leica-philes everywhere were dreaming about, and they will convert a fresh generation of birders to be Leica-philes. since this article was first published, Leica has added 8x50, 10x50 and 12x50 configurations, and there are compact models too. This article concerns only the 42-mm binoculars. 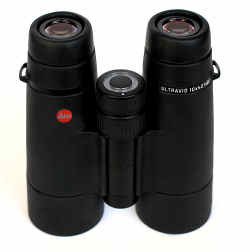 Physically, the Ultravid HDs are not visibly different from the original binoculars. They’re the same shape, they have the same black rubber armoring, the same stick-to-the-hands feel (that’s a good thing – not a complaint!) and they weigh the same paltry 26.4 oz. They are 6.1 inches tall with eyecups fully extended, and 5 inches across with the bridge open all the way. When you add in the contoured thumb ridges beneath the barrels and the beautiful balance to these binoculars, they become an effortless extension of the hands. They offer all the usual refinements of high-quality roof prism binoculars: waterproof, dust-proof, nitrogen-purged to be internally fog-proof – pretty much everything-proof except theft-proof, so keep an eye on your younger brother and spouse! Leica makes a truly fine binocular, and the Ultravids were already arguably one of the three or four finest on the planet. The Ultravid HDs’ optical performance lives up to that expectation. The Ultravid HDs are very bright. We’re won’t say they are the brightest binocular ever. We suspect that if you got a machine that measured exactly how much light gets through a binocular, there would be at least one competitor optic that exceeds them. That being the case, we will boldly tell you that you aren’t going to care! The difference is very small, and the image quality of the HDs simply outweighs any other factor under consideration. The view is so crisp and sharp that you stop looking at objects and automatically switch to reveling in details. You don’t look at species - you think about sub-species and plumage details. During testing we took them out on an overcast day and happened upon a female Merlin. (columbarius ssp., since you asked…) She was standing on a lamppost, silhouetted against that high, diffusely-lit sky that seems to drain the color out of everything. Except through the Ultravids, the colors weren’t drained. Instead, you could see the reddish overtones to the blotchy streaks of her chest and belly. You could make out the almost bluish shade in the dark brown of the back and wings. The broad dark tail bands alternating with crisp white ones… That the colors were that vivid under those field conditions spoke volumes to us. The way the image details just jump out and demand notice makes it clear that the Ultravid HDs are simply superb binoculars. Everything else is technical details – that’s all you really need to know. Well, okay, not all, or this review would be done right now, and it isn’t. 8x42 15.5 mm 389 ft/1000 yds 10.2 ft BaK4 27.9 oz. 4.75" x 5.63"
10x42 16 mm 330 ft/1000 yds 9.7 ft BaK4 26.8 oz. 4.75" x 5.19"
The Ultravid HDs are listed as having a 330-foot field of view at 1000 yards. If you look at 10x roof prism binoculars, this is roughly a 3% bigger field of view than is average for this class of optic. If you look strictly at the very best 10x roof prisms, you find that they all are listed as having a 330-foot field of view. So imagine our surprise upon looking through them, comparing and discovering that, for whatever reasons, the useful field of view – the part where the image was sharp and clear and not distorted or notably darker – was apparently bigger in the Ultravid HDs. With one competitor, it was fairly close, but with the other, it was not so close. This highlights another strength of the Ultravid HDs: their overall edge-to-edge performance is excellent. 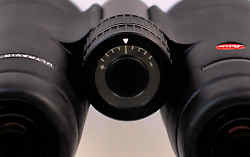 The “sweet spot” in the center isn’t limited to the center; it goes almost all the way to the edge, so again, the “useful field of view” in these binoculars is notably large. The color fidelity was top-notch, and the colors were brilliant. Again, we found ourselves awash in unfamiliar details of very familiar birds. The minimum close focus of the Ultravid HDs is listed as 9.7 feet. Leica admits to being very conservative on this statistic, and not making unsupportable claims. What they mean is 9.7 feet is the minimum distance at which the entire image is sharp and there is no field collapse (where the image goes partially or fully dark in one ocular). We’ve noted in the past that this is something that varies to some extent with the user. When we tested them, we got the Ultravid HDs down to about 8.5 feet without loss of detail or field collapse. The other thing to note in this is that often, extreme close focus comes at a cost of two things: apparent depth of field and the clarity at infinite focal length. The Ultravid HDs deliver great performance in both areas. The depth of field is better than on the other high-end binoculars we tested them against and the image at infinity is still notably sharp. While we’re on the subject, it takes about 1.3 turns of the focus knob to get from minimum close focus to infinity. Which brings us to the focus knob itself. As with other Leica binoculars, the focus knob also houses the diopter adjustment mechanism. We see versions of this mechanism more and more in binoculars these days, and frankly, we’re not big fans of it. For one thing, it is often quite poorly engineered, with the result that the mechanism suffers from serious flaws. That being said, this isn’t one of those mechanisms. To access the diopter adjustment, grab the focus knob and pull it towards you. It pops out quite easily, revealing a red line between the front and back knobs. Now the front and back knobs adjust the two oculars independently; the front knob (closest to ocular lenses) varies the right ocular focus and the rear knob (nearest to objective lenses) adjusts the left ocular focus. A white scale on top of the focus knobs shows where the adjustment stands, with a long central line denoting the position for equal eyes and five white hash marks to either side showing degree of the plus or minus adjustment. A frequent problem of such a mechanism is that it usually takes such force to pop out or push in the knob that one is in danger of accidentally mis-adjusting the diopter while operating the knob! The Leica mechanism seems to perfectly balance between too much and too little tension, so adjustment is actually quite easy. Eye relief on the 10x42 Ultravid HD is 16 mm, pretty much average on a 10x binocular. The nicely tapered eyecups adjust with a twist-up mechanism and have firm detents at fully in, fully out, and one intermediate position just shy of fully out. Leica tells us that their research shows that many of the closer in eyecup positions are not useful to most people, so they’ve only built in the positions that are. This is typical of Leica’s attention to the small details. The range of interpupilary distance spans from 55 to 75 mm, meaning that the Ultravid HDs will be quite comfortable even for users with somewhat narrower faces while still accommodating those of broader facial form. One other refinement is that Leica has added their AquaDura™ water-shedding coating to the outer lens surfaces. It’s a hydrophobic coating that causes water droplets to bead up and then run off more quickly so that in rain or dense fog, you spend less time looking through water. You can test it yourself (it’s sort of fun, once you get over being nervous about it) or you can take our word for it. Such coatings have been around for some years now, and they are getting more common in the market especially on high-end optics, but it’s a great feature, and we applaud its inclusion on the Ultravid HDs. Leica claims their Ultravid HDs are submersible to an industry-best depth of 16.5 feet, though honestly, we didn’t have the nerve to test that! The rain guard is nicely executed, being two deep cups of very pliable rubber linked by a flexible bridge. It fits easily and securely over the eyecups regardless of the barrel position - many other rain guards really only go on easily when the binocular is fully open or closed. The rain guard has a single closed bracket on the left side that the strap threads through. The only issue we’ve seen with this is that the fit between the rain guard and the eyecups can easily be too firm: during testing, we once accidentally removed an eyecup assembly trying to get the rain guard off. Not to worry – it pops right back on without ill-effect, but you can imagine a few very concerned moments for us until it did! The objective lens caps are better executed. Leica uses tethered lens caps with rings that fit, with a bit of a struggle, over the ocular tube, and connect to heavy caps that fit on over the rubber armoring. Again, this isn’t a criticism – the difficulty of fitting the rings onto the barrels means that once in place, they don’t move, and not moving is good! The tether is flexible enough that the caps hang down well and do not easily blow up to occlude the view through the optic, unless you happen to be birding in a tornado. The caps fit on smoothly and yet stay very firmly in place. That brings us to the case and strap. The case is a cordura construction with a double-toothed clasp mechanism to shut the closing flap. It is large enough to easily admit the binocular with the eyecups fully extended, the rain guard in place and the lens caps on as well. The case has minimal padding, which will dull the impact of minor bumps but won’t protect the binocular if dropped from height onto a hard surface. It is adequate without being excessive. The strap is really pretty nice, being a contoured (that is, designed to be worn in one orientation only) padded design that easily sits over the shoulders. It is soft and comfortable, without being overly bouncy, so that jumping off a rock doesn’t mean the binocular will hit you on the chin off the rebound. All well and good. Admittedly, these are trivial things – you don’t buy an expensive binocular for the case and strap. On the other hand, when you pay this much for an optic, you expect something better than merely decent on these little details. We’re happy to report that you get it. And since we’ve raised the ugly subject, yes, Leica Ultravid HDs are expensive. The 10x42 version sells for $2,299.00; the 8x42 model is a bit cheaper at $2,199.00, while the 7x42 configuration is a steal at $2,149.00! The Leica Ultravid HDs are for folks who are very serious about having very fine binoculars, and these are really beautiful binoculars! To look through them is to want them. We’ve kind of been dawdling about producing this review because we know that once it’s done, we have to send the Ultravids back to Leica. Maybe we’ll try telling them about our larcenous younger sibling . . .